Do you have a photo of Fudge the cat? Do you have any pictures or stories about our beautiful cat Fudge? Sadly, Fudge passed away unexpectedly on January 6th and we miss him very much. would like to add any other pictures that the Wolves Lane community might have and like to share. Wolves Lane has a new green budgie! Or just ask Reception to point you in the right direction! Wolves Lane Small Animal Centre – who’s here? Take a look at all the small animals who live at Wolves Lane Garden Centre! We have a number of rescue animals that have found a new safe home at Wolves Lane Garden Centre. They love to have visitors and hope that you will come visit soon! They’re at the back of the property – just walk through the greenhouse by reception, out the back and look towards the chicken coop and the barn. There are signs to show the way. Meet Peter – one of our newest rescue rabbits! We have a number of rescue animals that have found a new safe home at Wolves Lane Garden Centre. Peter, one of newest additions, loves to have visitors and hopes that you will come visit him soon! He lives with his new brother (also white) and two new sisters (with shiny black coats). In the day, he nibbles the grass outside. At night, he sleeps in the barn where he is safe from the foxes! He’s at the back of the property – just walk through the greenhouse by reception, out the back and look towards the chicken coop and the barn. There are signs to show the way. Or just ask Reception to point you in the right direction! MP Catherine West visits Wolves Lane! Catherine West, our Labour Member of Parliament for Hornsey & Wood Green, visited Wolves Lane Garden Centre on November 12th. She met with adult learners…who introduced her to an exotic species of cockroach! These are a special type of “hissing” cockroach and are kept in an eco-tank habitat in the Learning Centre classroom at Wolves Lane. Cockroaches are quite interesting when you get to know them! They play an important part in the environment. I love to meet new people and hope that you will come visit me soon at Wolves Lane Garden Centre! You can talk to me – I enjoy chatting and chirping with new friends! I came to Wolves Lane Garden Centre as cockatiels like me live a long time and I needed a new home. I don’t know how exactly old I am – but I feel quite young! I like to play with my toys and clean my feathers. I live near the front, by reception. Come in the front door, turn right past reception and keep walking along the greenhouse doors. My home is in the main display hall. Featured Animal Friend at Wolves Lane: the Gwinns! 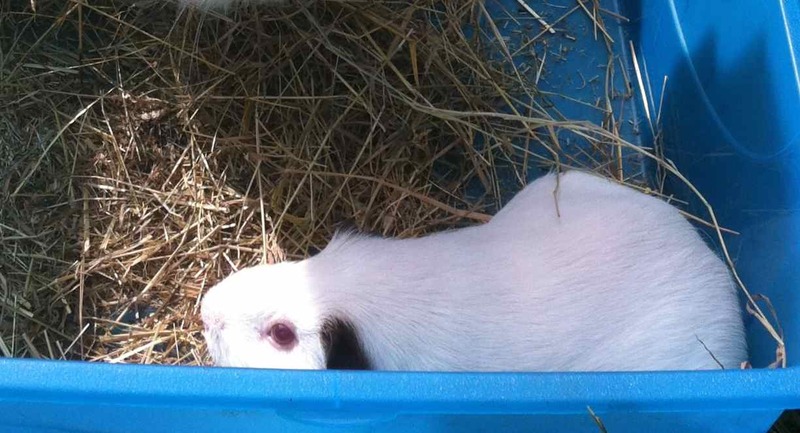 Hi, I’m one of the two resident guinea pigs at Wolves Lane Garden Centre – we’re known as The Gwinns! There are two of us and we look very similar but really we are very different. I’m very noisy and like to talk all the time but my brother is really quiet. Can you tell which one I am? My brother and I share a big hutch in the barn with our best friend, Piggy, the lionhead rabbit. The barn keeps us safe from foxes and warm at night and in the day we go outside to eat lots of grass. We love to have visitors and hope that you will come visit us soon at Wolves Lane Garden Centre! We’re at the back – just walk through the greenhouse by reception, out the back and we are near the chicken coop and the barn. There are signs to show the way. New Animal Page at Wolves Lane website! We’ve got lots of rescue animals that have found a new home at Wolves Lane Garden Centre. Come take a look at our new website Animals page that tells you all about them! The animals are at the back of the property – just walk through the greenhouse by reception, out the back and look towards the chicken coop and the barn. There are signs to show the way. 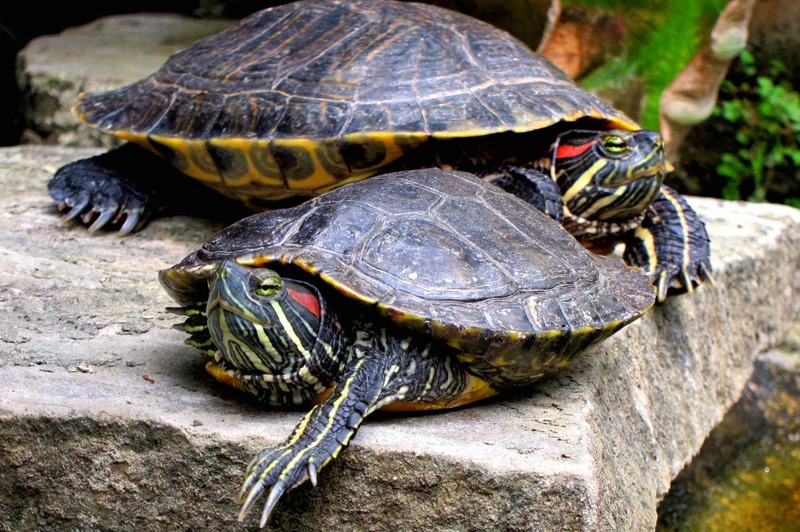 There are also terrapins and koi in the Palm House to visit. Hello, I’m a white rescue rabbit called Piggy – I’m called Piggy because I have a smudge on my nose that makes me look like a piglet! I’m very happy in my new home at Wolves Lane Garden Centre. 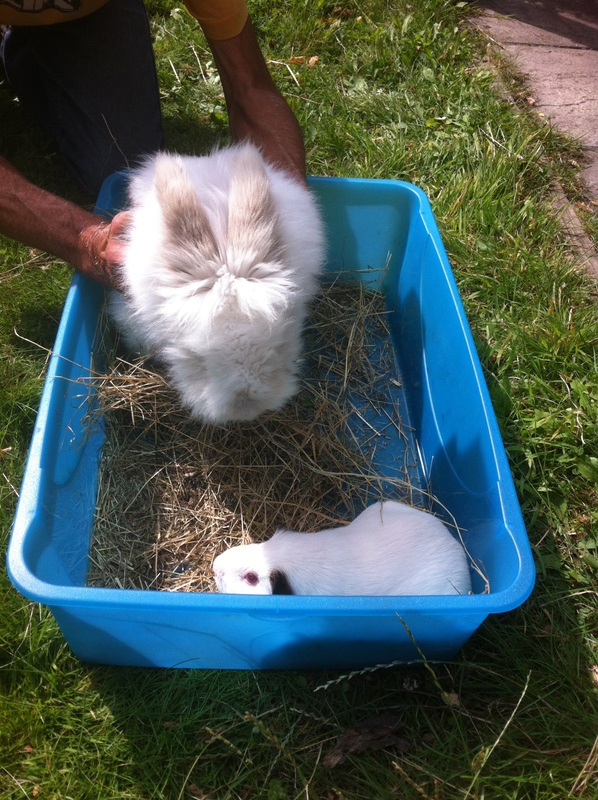 My best friends are the ‘Gwinns’ – two white guinea pigs that I met when I came here. We share a big hutch in the barn which keeps us safe from foxes and warm at night and in the day we go outside to eat lots of grass. Rabbits are supposed to eat a range of food including hard food that helps to wear down their teeth that never stop growing. I am not that keen on hard food so my teeth did keep on growing and this made it very uncomfortable for me to eat so the Vet removed my front teeth and now I can eat all the soft food that I like.